A subconjunctival hemorrhage is similar to an ordinary bruise on the skin ? it?s like a bruise of the eye. It usually appears as a single, concentrated spot of red, or many scattered red splotches, on the white of the eye. The redness is blood under the conjunctiva, a clear membrane that covers the white of the eye (called the sclera) and the inner eyelids. 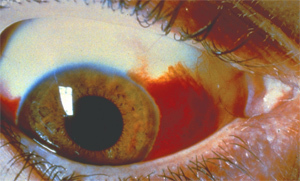 In this example of subconjunctival hemorrhage, a large red spot covers the white of the eye. The conjunctiva contains numerous blood vessels and capillaries, the tiniest blood vessels in the body. These vessels can break, causing blood to leak between the conjunctiva and the sclera. This minor bleeding under the eye?s outer membrane is what causes the bright red spot to appear on the white of the eye. Seeing a subconjunctival hemorrhage on your eye can be alarming. Yet it is actually a common occurrence, almost always harmless, minor, and will heal on its own. It does not affect vision and generally does not cause pain. There are usually no sensations or symptoms, other than the appearance of the red spot. In fact, a person may not even be aware that he or she has a subconjunctival hemorrhage until someone points it out, or the person looks in the mirror. The most common causes are coughing, sneezing, straining, or any similar action that temporarily raises blood pressure in the veins, leading to a small rupture in a blood vessel or capillary. Subconjunctival hemorrhage can also occur because of trauma to the eye, even minor trauma such as rubbing the eye vigorously. Other common but less frequent causes of subconjunctival hemorrhage include diabetes mellitus, high blood pressure, and excessive amounts of certain medications such as aspirin or blood thinners like warfarin (Coumadin? ), which affect the body?s bleeding mechanisms. Much less frequent to rare causes may include blood clotting disorders or other systemic blood disorders. If you have recurrent or excessive subconjunctival hemorrhages, your ophthalmologist (Eye M.D.) will perform a medical workup, assess your risk factors, and order appropriate laboratory studies, sometimes in collaboration with your primary care physician. Treatment is generally not necessary. Over time, the blood spot will slowly disappear, clearing up on its own. This may take days or weeks, depending on the size of the blood spot. If your eye is irritated, your ophthalmologist may recommend that you use over-the-counter artificial tears. In general, expect your ophthalmologist to reassure you that the blood spot will go away. Although subconjunctival hemorrhage can seem alarming, it is usually a temporary, harmless condition that your ophthalmologist can assess appropriately for you.